Good but not exceptional. The bowl could be more interesting in flavours; salad is rather tasteless, rice is dry and there is not enough sauce with the balls. Blondie is very good, banana bread is good although very dense. 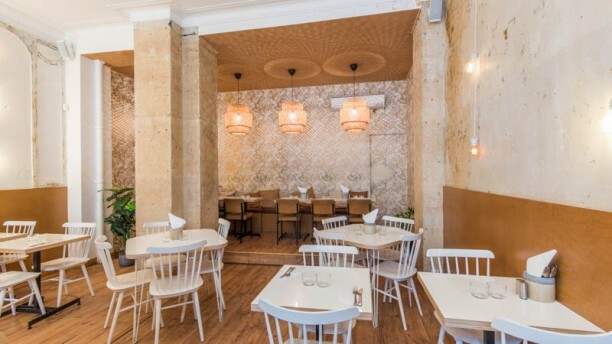 Nous is a great, relaxed and informal restaurant. There is a great selection of vegetarian food and it's very reasonably priced. Great quality food, very fresh and a great environment to enjoy a meal with friends. Can definitely recommend the nourger burger! Many thanks for a great time. Hip, trendy spot. Excellent service. Healthy, creative menu. Went with my grandmother and two pregnant sisters and the restaurant was enjoyed by all! The food was tasty and fresh. We enjoyed our smoothie as well as the dinner. Definitely recommended! A very surprise, you have got to try! We liked it very much and will come back for sure. The food was tasty and healthy, the staff super welcoming and the ambience invited to chill out.